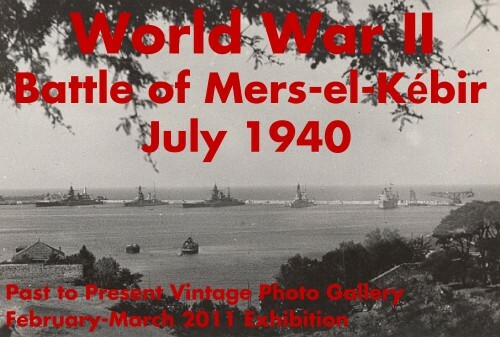 Our new exhibition present a large group of photographs of the attack on Mers el-K�bir, French Algeria, North Africa, which saw the British Royal Navy disable the French fleet, by fear that it would fall in the hands of the German Navy, 2 weeks after France signed the Second Armistice at Compiegne on June 22nd, 1940. We have also included a small group of photographs from the Battle of Dakar, French West Africa (now Senegal), which took place between September 23 and 25, 1940. Part of the same small archive were 2 photographs of the scuttling of the Admiral Graf Spee in the port of Montevideo, Uruguay in december 1930.